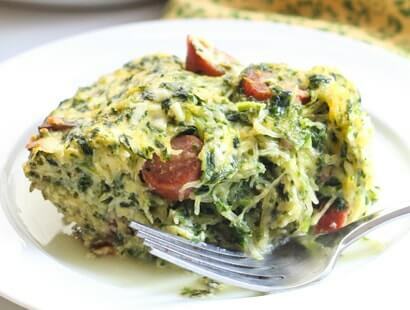 This unexpected breakfast casserole is made with spaghetti squash, spinach, crumbled feta and all-natural breakfast sausage. Preheat oven to 350˚F. Cut spaghetti squash in half lengthwise and place cut-side down on large baking sheet lined with parchment paper. Bake until soft and squash halves can be squeezed easily. Meanwhile, cook sausage in large skillet. Thinly slice and transfer to large bowl. Heat butter in same skillet over medium heat. When melted and hot, add mushrooms, garlic and salt; sauté until mushrooms are golden brown. Transfer mushrooms to bowl with sausage; add spinach, feta and parmesan. Remove squash from oven; scoop out and discard seeds. Scoop flesh into bowl with other ingredients. Mix well to combine. In medium bowl, whisk together eggs and whipping cream. Stir into vegetables and mix well. Season with additional salt and pepper to taste. Spread mixture in greased 9"x13"glass or ceramic baking dish and bake 40 to 60 minutes, until puffed and set all the way through. Remove and let cool a few minutes before serving.